The other side of brokenness...God loves broken people. And when weary, wounded men and women find a way to open their bruised hearts and somehow welcome Him into their personal darkness, they will find a love beyond anything they have ever known. When the glass house Sheila had lived in for so many years came crashing to the ground, she began a new life outside the safety of those walls. No, it didn’t feel good, nor safe—not at all. But it felt true. Sheila saw herself as a broken lamb limping after the Shepherd, not knowing where He was going, but knowing that wherever He went, she wanted to go with Him. 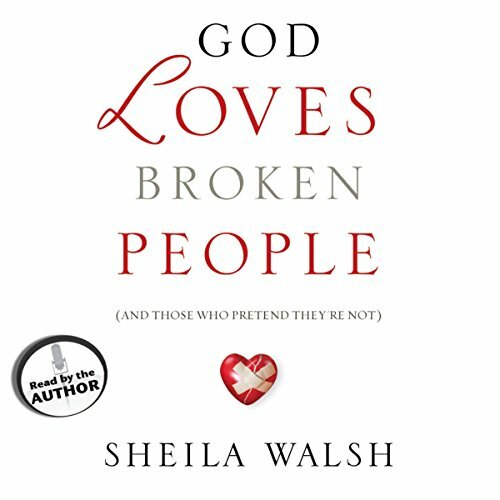 In 12 stirring, insightful, and deeply revealing chapters, Sheila Walsh shows how personal brokenness can open doors of intimacy with Jesus Christ that might never open in any other way. It’s not that God loves broken people more than those who imagine themselves to be whole—it’s simply that they know they are loved. They dare to believe it...and through such trust, a new wholeness emerges from yesterday’s broken pieces. I really loved this book. it spoke to my spirit in a time of great need. I love to hear the author read their words especially Sheila Walsh. Her story is so compelling to hear. And with the topic of brokenness! This book speaks such goodness and mercy over brokenness. It's been a much needed reminder of how God uses us and our brokenness. How he gives us grace in it and how we can trust him through it. Yes, I recommend this audiobook to anyone that consider's themselves broken, grieving, and/or has experienced child or adult post trauma (or both). Sheila address' the most difficult subject matters with grace, sincerity, and love. She remains faithful to God's word, allowing the reader/listener the ability to "evaluate" her view. What does Sheila Walsh bring to the story that you wouldn’t experience if you just read the book? Sheila communicates a gentle and carefully delivered narration of one of the most difficult subject's for people that have been affected by tragedy and grief. This book is very personal, and I admire Shiela for sharing her truth and the challenges she faced while recovering emotionally. Anyone who is rebuilding their life, or has rebuilt their life will relate to her journey. This book is comforting! Sheila, I am giving praise to our Lord for working through you so that we can receive his comfort. I especially liked the many references to scripture. What did you love best about God Loves Broken People? has a great balance of love and disapline in a loving way. What did you learn from God Loves Broken People that you would use in your daily life? helped to open in mind and heart to some things that have been hard to understand. This is an incredibly powerful book on the concept of brokenness. Sheila inspires me to walk this life before God. She inspires me to except that my brokenness may not be fixed in this life, that pain and suffering are not an aberration necessarily. She reminds me that God is never surprised by my circumstances and pains. She inspires me to press on accepting what God leads and permits and trusting in him. What a blessing this book was to my heart, one who knows she is broken. I truly appreciate the author reading the book herself, gave a real personal touch that blessed my heart. This is the first book by Slheila Walsh that I have read. I love the way she incorporates bible verses in almost everything paragraph.. I highly recommend to read this book in you are wanting peace and comfort. a helpful reminder of how God uses pain to grow and prepare his servants to know him and minister that knowledge to other hurting individuals. God wastes none of his people's sorrows. I love this nbook. Sheila Walsh communicates her message beautifully. you can not help but walk away from this book changed. A must read for all!! !